Virtually every time an accident occurs in which a participant in the incident is severely injured, that motorcylist will retain an attorney in an effort to recover monetary compensation for his or her pain and suffering and, possibly, for other damages. Let's look at a case where that attorney knows essentially nothing about motorcycles but who retains the services of an accident reconstructionist to help him build his case and then relies entirely on that reconstructionist to help him build his case. A motorcyclist was riding at 35 MPH eastbound on a city street one morning as part of his daily commute to work. Just after he safely crosses a major intersection along his way, he noticed that a large commercial 18-wheeler truck was pulling out of a driveway in front of him in order to cross the eastbound lane of traffic. He was afraid that his motorcycle would collide with that truck, so he applied his brakes in an effort to quickly stop and thus avoid the collision. As a result, both tires began to skid and the motorcycle soon thereafter fell to its side and scraped/gouged its way eastbound on the roadway until it came to a complete stop. The rider was seriously injured when he hit the ground. The motorcycle did not hit the 18-wheeler, which continued its travel across the eastbound lane and turned left onto the westbound lane. the collision cannot be prevented. This was a very curious argument for him to make as, in fact, no collision had actually occurred. Where did the attorney get the impression that the motorcyclist had already past "the point of no return" when he first noticed the truck and what made him think that was true? Well, of course, that phrase and "proof" came in the form of the report that was prepared by the accident reconstructionist he had retained. When reading his report I was struck with a few other curious statements that were made in it. For example, it was stated that "It is well known that a motorcycle without ABS is only capable of attaining about 60% of the braking efficiency of a vehicle, like the truck, which does have an active ABS system installed." Now that is simply not true. Braking efficiency is a measure of how much of the potential of a braking system is being used during a stop. If only the rear brake on a motorcycle is being used, for example, then the braking efficiency of that motorcycle at the time is somewhere near 40%. If both brakes are being used but the rider elects to attain a deceleration rate of only .6g's when the bike is capable of attaining a deceleration rate in excess of 1.0g's, then the braking efficiency could be described as being about 60% during that stop. But if both brakes are locked and both tires are skidding as a result, then braking efficiency during that stop is, by definition, 100% - it is impossible to get a higher deceleration rate by using more braking pressure. And what on earth does it matter if a non-ABS motorcycle is unable to stop as quickly as another vehicle that has an active ABS system (not true, but that was the argument)? There was no other vehicle involved in this motorcycle's braking. The report went on to say that because the motorcycle did not have ABS, it's braking efficiency was 60%. Then, when it was disclosed that the coefficient of friction of the roadway and motorcycle tires was 0.6, that the motorcycle's maximum deceleration rate when skidding was only 0.6 times its braking efficiency of 60%, or 0.36g's. That's preposterous. While skidding that motorcycle was decelerating at 0.6g's - by definition. And by the way, I will remind you that even brand new riders without any riding experience at all, on an unfamiliar bike only two days into their BRC training are expected to be able to brake at a deceleration rate of 0.6g's. But the motorcycle wasn't skidding for long. Most of the time it was sliding on its side. 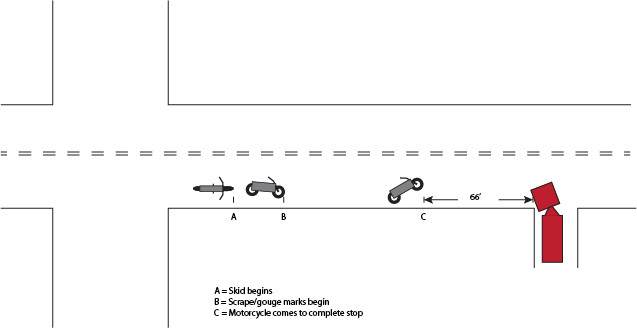 Even on its side sliding on asphalt, that motorcycle attained a deceleration rate greater than the reconstructionist claimed was the highest a non-ABS equipped motorcycle could attain when braking on its tires. I left out the measurements of skid and slide distances above in that ultimately they were not important. For the fact is that no matter how badly the rider performed his braking function, his motorcycle stopped 66 feet short of a collision with the truck. Had the motorcyclist used better braking skills, he would have stopped with even more distance between his bike and the truck. The case settled immediately after the expert witness reports were submitted. The motorcyclist received a token payment rather than the substantial amount requested. It was cheaper, by far, to settle the case for the token amount than to have to take the time and effort to go to trial. As far as the motorcyclist's attorney was concerned, he found that he had no case at all and so any settlement at all was acceptable to him. The trucking company had deep pockets so they were targeted by that attorney. However, the truck was a distant and uninvolved participant in the accident. The accident reconstructionist was a 'gun for hire' - a person willing to say anything for a price. Had the case gone to trial, he would have probably been allowed to testify based on his credentials, but his testimony would have been easily seen by a jury made up of even a set of laymen from a motorcycling perspective, as uninformed or blatantly dishonest or simply stupid. But what do I know? In any event, you can be sure that he is never again retained by that attorney. If you ever have need for an attorney in a case involving a motorcycle accident, you must select one who knows about motorcycling. At least then you will have some confidence that he will be able to properly select his expert(s) and determine whether or not what they say has merit. That is a charitable recommendation. Alternatively, you are advised to select an attorney who knows about motorcycling so that they are disinclined to look for hired guns to make their case. This rider was both the cause and victim of his own accident.